I received several emails regarding my Religion Edit of Super8 & Tab feat. Alyna “Delusion”. First off, let me thank you all very much for your nice feedback! Regarding your question if I can share this Edit with you…I’m sorry, I can’t give this Edit away, because the original track is licensed to the label Anjunabeats and the acapella of Madonna probably to some of her labels. I hope you understand this. I’m sorry, but thanks again for the nice feedback! 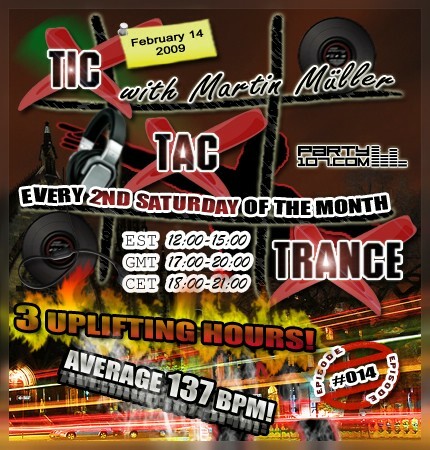 As promised in the lastest show, episode #014 of Tic Tac Trance on February 14 will feature only uplifting tunes. This time I have done an extended 3 hour mix and bring you the lastest and hottest records from labels like Flashover Recordings, Anjunabeats, Vandit, Redforce Recordings, Perceptive Recordings, Armada Music, Enhanced Recordings + many more. Furthermore I’ll spin awesome mashups done by XiJaro! This show will be really special, so make sure you won’t miss it! Or did you really expect a Valentine’s Day special? My show starts February 14 at 18 CET / 17 GMT / 12 EST. Check out your local time HERE!